Contrary to much anxious industry speculation, I don't crave extreme entertainment when I shop. I am not looking to ski, surf or take in a show at the same time. I simply want to find a wider selection of exciting clothes and accessories to choose from that make sense for my current age and lifestyle. I have been a member of your community for many happy years (decades! ), but I have something I need to get off my chest. Like many women, I shop more online. I don't have a lot of time to wander through stores hoping to discover clothes that tempt me. Meanwhile, I'm a bit bored with my current wardrobe. I have a ton of occasions to dress for, and some money to spend, but something is wrong. The thrill is gone. Contrary to much anxious industry speculation, I don't crave extreme entertainment when I shop. I am not looking to ski, surf or take in a show at the same time. I simply want to find a wider selection of exciting clothes and accessories to choose from that make sense for my current age and lifestyle. This is not to say that I want someone to present me with a selection for "women over 50." God forbid. No one likes to be labeled that way. I may be over 50, but in my head, I'm ageless. Even more to the point, I hate the whole concept of "Dressing by Decade." (What to Wear in Your 20s, 30s, 40s, etc.) Having been a magazine editor, I know why these stories are perpetually popular: women want guidelines and delivering them is an easy way to engage readers. But the difference in the way you dress when you are, say, 49 versus 52 is pretty negligible. The idea that all women born in the same decade should wear the same things is ludicrous! We are as diverse now as we were as teenagers. One's style does evolve over time--and should--but there's no specific formula. The number of years you have lived isn't that relevant. I don't wake up and think, "Today I am 59, so I'm going to wear this." It's more about your confidence, comfort, where you live, and what you do. No matter how old you are, you still want to look like you. When did designers and companies decide that sleeves were obsolete? Or that if you design a dress with sleeves, it should hit at least 18 inches above your knees? Don't get me wrong! Plenty of my friends and peers are in fantastic shape. Perhaps even better shape than they were in their 30s. But not every occasion calls for a lot of bare skin. One size doesn't fit all. And merchants, know this: catering to just one demographic--the millennials--will not improve your sales figures. 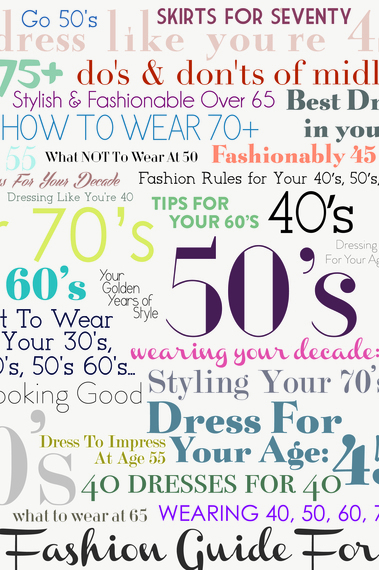 A woman emailed us recently at info@apprecier.com and asked, "Now that I just turned 60, what should I wear?" I answered her respectfully, asking for more information about her preferences, but the question broke my heart. We are all more than the sum of our years or our measurements. Treat us with respect, entice us, talk to us, charm us, make us laugh! You'll be rewarded.